As a facility manager, you're concerned with building quality into your operation but possibly unsure about how to go about it in a systematic way. Perhaps it's because a Total Quality Management program seems too imposing and costly for your department to undertake. Or maybe you're leery of certain aspects of such a concerted effort, like measuring quality or marketing facility services, because they've never been adequately explained to you. Possessing considerable backgrounds in facility management, Stormy Friday and Dave Cotts understand these uncertainties. In Quality Facility Management, they have pooled their knowledge and experience to develop a comprehensive resource that demystifies the quality movement and shows you how to apply the old-fashioned but enduring commonsense principles of quality management often overshadowed by TQM. Flecked with humor and written as if the authors were simply talking to you, this refreshing new book identifies the five major elements underpinning any effective quality facility management program and takes you step by step through each one in a detailed yet accessible way. Gradually, you learn how to put these elements all together and—by incorporating selected modern techniques—devise a program to meet your specific situation. The final chapter provides a bounty of practical case histories of companies that are realizing quality facility management right now, including major organizations like Celestica, Bell Atlantic, Hewlett-Packard, and Lockheed. Here, you'll find ample evidence of quality tools and strategies at work—from interior preventive maintenance crews to staff productivity improvements, infrastructure planning teams to customer satisfaction programs. Indeed, whether you're in the public or private sector, in a large or small facility, part of an in-house organization or a contracted firm, Quality Facility Management enables you to plan, organize, staff, direct, and evaluate for quality, so that you maximize your department's responsiveness to customers and your value to top management. Quality facility management is the only way to do business. Here's the only way to do quality facility management. Facility managers want to answer the call for quality but many feel they don't have the resources or guidance to make it an essential feature of their operation. Total Quality Management programs require too much of them and various aspects of the quality effort, whether it's quality measurement or facility marketing, seem hard to carry out or even beside the point. With the assistance of examples, checklists, and other handy tools, this invigorating resource reveals the five key aspects of quality facility management and shows you how to bring them all together to develop a program that fits your particular circumstances. 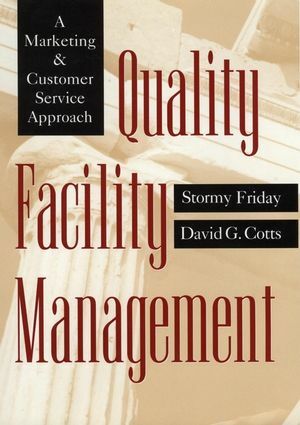 Packed with case studies of facility managers who are building quality into their operation, Friday and Cotts's Quality Facility Management illustrates how your quest for quality can dramatically upgrade customer and senior management satisfaction—without draining department resources. A former practicing facility manager, STORMY FRIDAY is President ofThe Friday Group in Alexandria, Virginia, which providesmanagement, marketing, and facilities services to commercialbusiness and government. She lectures extensively worldwide onfacility management issues. DAVID G. COTTS is Chief of Building Maintenance and Repair for TheWorld Bank headquarters in Washington, D.C. He is a past presidentof IFMA and also teaches facility management at George WashingtonUniversity. Quality and Customer Service Are Synonymous with FM. Total Quality Management (TQM) Principles and Quality FM. Measuring Quality and Customer Satisfaction with FacilityServices. The Importance of Marketing Facility Services. The Concept of Continuous Improvement. The Quality Management Way: Best Practices.